Aurora Capital and the Gottlieb estate are planning a massive development on the south side of Gansevoort Street between Greenwich and Washington Streets. The renderings below tell the story. 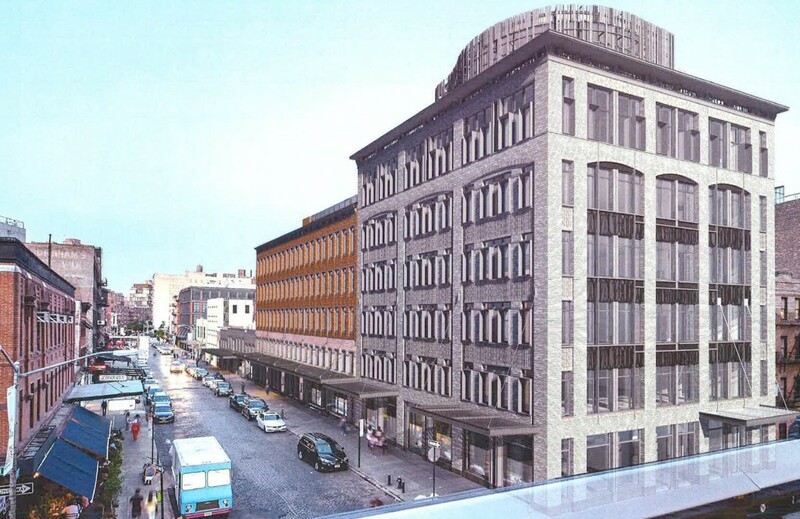 This project will need approval from NYC’s Landmarks Preservation Commission before it can proceed. We believe that that LPC should reject this application. For a detailed discussion of our objections to this plan, please see The Wrong Plan in the Wrong Place. 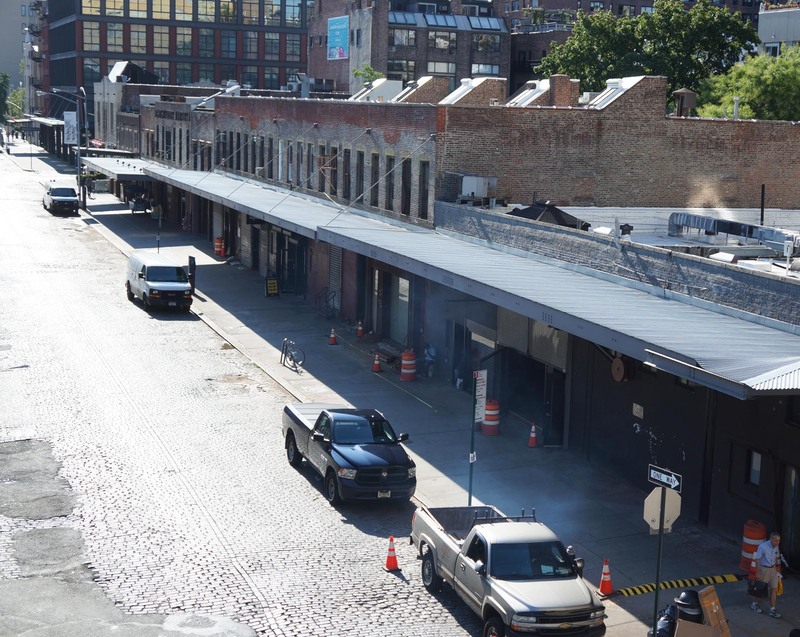 For an analysis by Gregory Dietrich Preservation Consulting of the negative impacts which this plan would have on the Gansevoort Market Historic District, please see Analysis of Impacts of Proposed Development. The existing one-story building will be demolished and replaced by an entirely new building. The new building will be 8-stories tall with a total height of 120 feet. There will be a 6-story, 83′ streetwall, then two additional stories that add another 29′ of height set back 20′ from the streetwall, plus mechanicals. The 2-story setback is the odd curvy glass structure on top of the building. This will be a 4-story addition on top of the existing 2-story building. Total height will be 98′, including mechanicals. 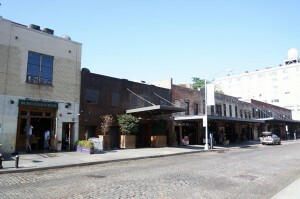 The streetwall will be 68′, then the 15′ tall top floor will be set back 20′ from the streetwall. No changes in height. However, the upper floor will be extended 15′ south towards the rear yard. The existing building will be demolished and replaced by a new structure. The new building will be three stories tall, even though it has 4 stories of windows (the windows don’t match the floors). Total height will be 52′ including mechanicals. Office space is the most profitable use of upper floors in this area, and it’s clear that the developer originally planned on office use in the upper stories of all these buildings; they acknowledged that this is the use they listed in their DOB filings just a few months ago. However, there is a restrictive declaration on this site that prohibits offices. The developer has indicated that they will attempt to amend the restrictive declaration after they are finished at Landmarks. They claim that if necessary they can make this project work with restaurant, retail, gallery use, and non-profit use (this last incidentally, may not be allowed as-of-right; they acknowledged that the question is “complicated”). We believe that this project may not be economically viable if office use is not allowed, and will fight any attempt to change the restrictive declaration. The application for this development is currently scheduled to be heard at the November 10th meeting of the Landmarks Preservaton Commission. The developer expects construction to take about 18 months once they break ground. The developer’s renderings of this project can be found here. Hoping the Landmarks Commission and other protective agencies can intervene on this last attempt to maintain an areas look and feel. We do not need to be totally engulfed in larger intrusive buildings, and a density that will ruin the nature of this part of our CULTURAL HERITAGE . We do not need to be totally engulfed in larger intrusive buildings, and a density that will ruin the nature of this part of our CULTURAL HERITAGE .